New Jerusalem is the wife of the Lamb, Jesus Christ (Rev. 21:10). In this record, the bride, the wife of the Lamb, Jesus Christ, equals the holy city, Jerusalem. Jesus Christ will not take a physical city as His wife. The holy city is a living person! It is composed of all God’s people, chosen, redeemed, and matured in life. 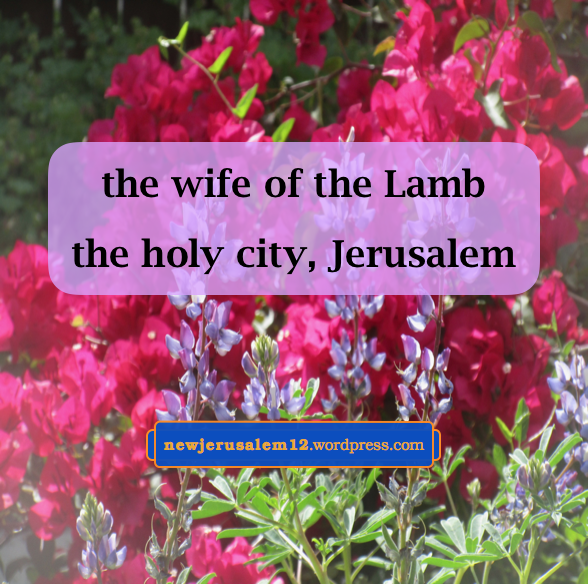 This city, the wife of the Lamb, is the outcome of John 3. 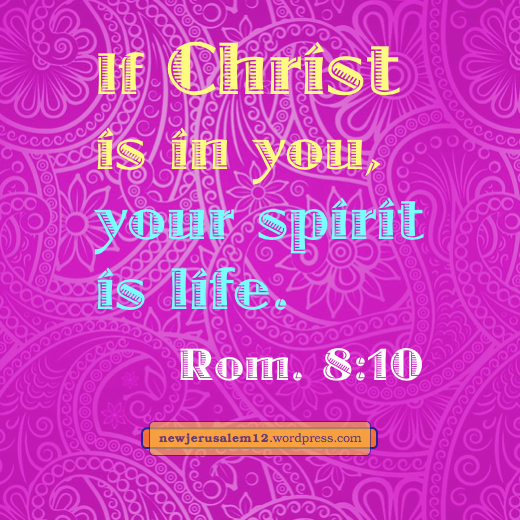 In 3:3-6 the Lord Jesus speaks of being born again, our human spirit born of the Spirit. In 3:14-17 all who believe are saved from the death brought in by the serpent, Satan, and receive eternal life. In 3:26-30 the people coming to Jesus, the Bridegroom, and believing into Him are the bride. Verses 31-36 confirm that Jesus came and that those who believe into Him have eternal life. 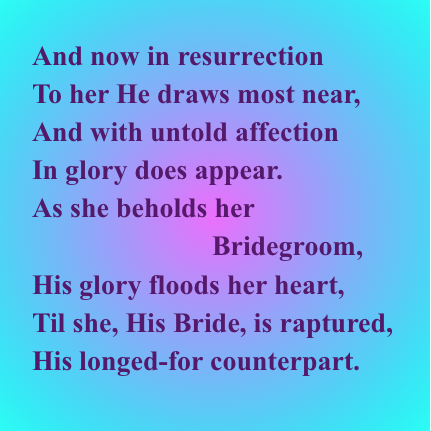 The bride, composed of all the born again people, who all have eternal life, is the Lord’s bride, His increase! That the city, Jerusalem, is the bride, the wife of Jesus Christ, is also seen with the church presented to Christ in Ephesians 5:25-27. This presentation is in the context of human marriage, which is a picture of the eternal marriage of the Lamb, Jesus Christ, and the city, Jerusalem. 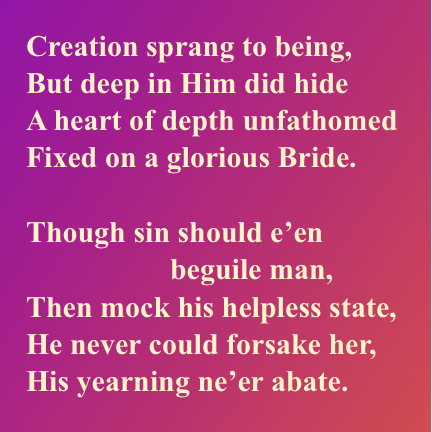 Here is the last verse of a song about Christ’s love for His wife, initially the church and eternally New Jerusalem. This part of the song begins with resurrection. Both the church and New Jerusalem are in resurrection because they exist solely in and with the resurrection life of Christ. “She beholds her Bridegroom…” This is like Hebrews 12:1-2, let us “run with endurance the race which is set before us, looking away unto Jesus, the Author and Perfecter of our faith.” He is both the Initiator and the Completer. We are not capable of becoming the glorious church and city, but He will complete this process in us. Thank Him. “His glory floods her heart.” This is happening today. In 2 Corinthians 3 we turn our hearts to the Lord and “we all with unveiled face, beholding and reflecting like a mirror the glory of the Lord, are being transformed into the same image from glory to glory, even as from the Lord Spirit” (v. 18). His open appearing in glory will be at His second coming: “they will see the Son of Man coming in a cloud with power and great glory” (Luke 21:27). But His spiritual appearing is available to us now as we turn our hearts and look away to Him. Eventually His bride will be raptured and then come down out of heaven, “the bride, the wife of the Lamb….the holy city, Jerusalem, coming down out of heaven from God, having the glory of God” (Rev. 21:9-11). _Now behold the greatest wonder—New Jerusalem descend! _She’s the Bride, prepared, adorned for Christ—of all God’s work, the end! The Lord Jesus Christ is the Husband, as John the Baptist told us in John 3:28-29. The New Jerusalem, the composition of all God’s chosen, redeemed, regenerated, transformed, and glorified people, is the bride. The last verse of the song includes In His holiness and glory He’s expressed through all of them. 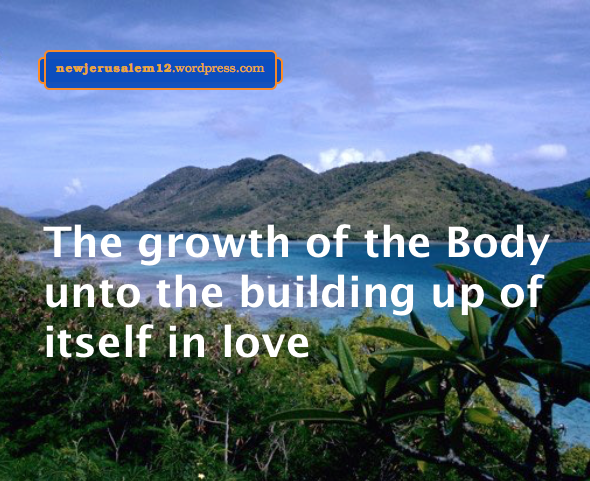 “All of them” is all God’s people built together in Christ to be New Jerusalem. Because God is holy, and all His people partake of His holiness, New Jerusalem is “the holy city.” Likewise, because God expressed is glory, the city “has the glory of God” (21:11). The last line of every verse in the song is The victory is won! This victory is Christ’s triumph on the cross, plus His triumph in applying all that He is into us, and the elimination of all negative things in the universe by the judgements in Revelation 17-20. This brings us to the last chorus, which is Hallelujah, hallelujah! The victory is won! 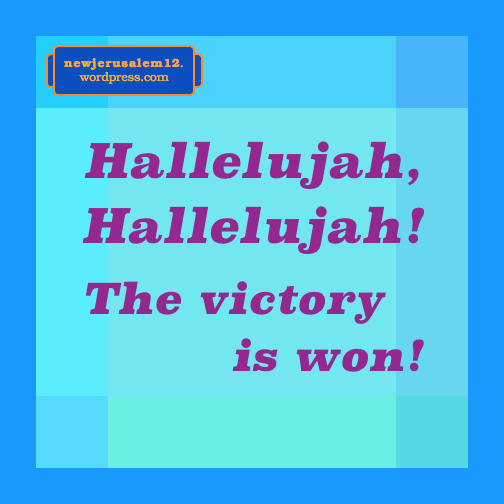 New Jerusalem proclaims God’s victory eternally. Let’s rejoice and praise now to prepare for that day! _Now rejoice and be exceeding glad! What glory is displayed! _For the marriage of the Lamb, the wife all ready now is made! These words correspond with Revelation 19:7. John says here, “Let us rejoice.” This comes from the exhortation in the heavenly praise in 19:5-6 concerning God’s reign. 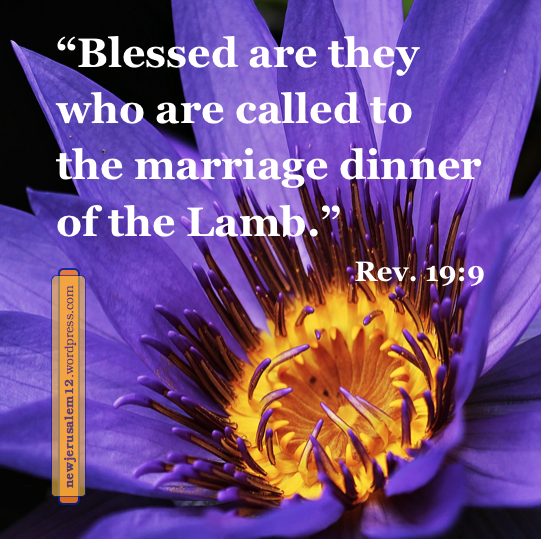 In 19:7-9 the praise and rejoicing continues to the marriage of the Lamb. 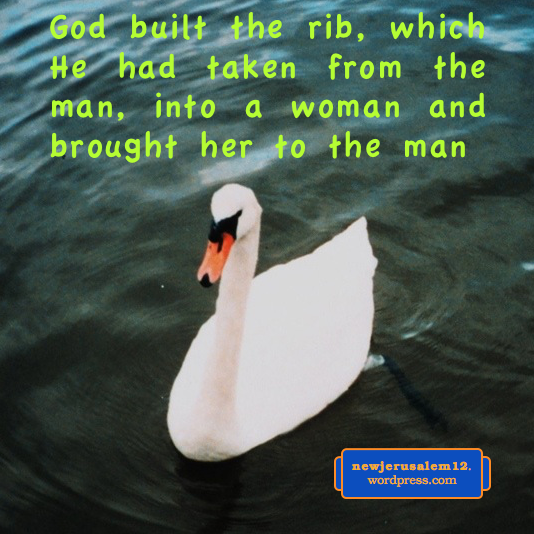 The Lamb, Jesus Christ, is the eternal Husband, and New Jerusalem is His eternal wife. This is clearly stated in Revelation 21:2, 9-10. The fine linen is not a physical garment, but is our righteousnesses, our righteous acts. These acts are Christ Himself coming forth in our living. This is the result of our giving ourselves to gain Christ and be found in Him in daily life, having Him as our righteous living, as presented in Philippians 3:7-9. This expression of Christ in our living is a precursor of His much fuller expression through New Jerusalem. The tenth verse of the song presents Revelation 20, the devil cast into the lake of fire. This is the final step of carrying out the judgement Christ accomplished on the cross. This is cause for more praise; the song says, Hallelujah, never more need we his provocations bear!. The judgements in Revelation 20 are the last step before the new creation appears with New Jerusalem. For every one of these steps we can rejoice. Hallelujah!